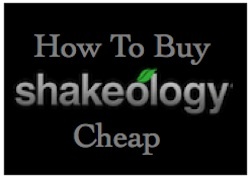 There is only one way to buy Shakeology cheaper than the retail price of $129.95. Its also important to know that the only place you can buy Shakeology from is Team Beachbody. 1. Sign up as a Beachbody Coach and buy Shakeology for $98. (You’ll see the price during sign up.) Coaches get a 25% discount on all Beachbody products. You can save money on shipping by selecting the auto ship option where a bag is sent every 30 days. Do this and shipping is $2. Otherwise it costs about $15. I recommend signing up as a Beachbody Coach like I did. The $40 sign up fee is a wash on your first order and you’ll save $30 on each following order. Select auto ship for $2 shipping and the 25% discount covers the $16 a month fee to have a coach account. My estimates are I’ve saved (129.95 – 97.46 = 32.49 – 16 fee = 16.49 a month x 12 months = 197.88 a year x 8 years = ) $1583.04 over the past 8 years because I buy Shakeology through the coach account. What about eBay, Craigslist, Facebook Marketplace, or Amazon? I know what you’re thinking. Shakeology must be cheaper on those sites. You need to know that some of the listings on eBay and Craigslist are scams. The majority of the listings are legit and are people who bought Shakeology on auto ship but did not use Shakeology daily. Before you know it they have 3 unopened bags of Shakeology sitting in their kitchen totaling $360 and are just trying to get some money back. My suggestion to these people is to cancel the auto shipment and work through the bags. What happens with the scams? Then you have to deal with tracking down the seller, getting eBay, and PayPal involved. I guess if you’re meeting somebody face to face via Craigslist then you’ll be ok. But do you really want to buy food from somebody you’re meeting via Craigslist? I love Craigslist. I have bought and sold a ton of stuff through it but never food. When you buy directly through Team Beachbody you will not have to worry about those issues. Their customer service people are there to take care of you if you have any questions about your order. Beachbody does not have an account on eBay or Craigslist and does not allow any of their coaches to sell Shakeology there. Beachbody does have an account at Amazon but is not sold there as it is a Team Beachbody exclusive product. If you do not want to be a Beachbody Coach I still recommend you buy Shakeology from one. Most use Shakeology daily and are doing one of the Beachbody workouts. They can answer any question you have about Shakeology. And if they can’t they can point you in the right direction to get it answered. Beachbody has their “Bottom Of The Bag Guarantee” with every bag purchased. You can return the bag of Shakeology even if its empty for a full refund minus shipping and handling as long as you do it within the first 30 days of ordering. Thats why you might as well use the monthly autoship order process for free shipping on the first order. If you don’t like Shakeology then you break even on the shipping. Otherwise you’re out the first $15 shipping cost. To make a return you need to call Beachbody’s Customer Service people and they will take care of you on the spot. The return policy is the same for the coach account too. Don’t want to be a coach in the first 30 days? Cancel your coach account and get fully refunded the sign up fee and the cost of the empty bag of Shakeology your sending back. Saving a few bucks on Shakeology is not why I signed up to be a coach many years ago but since I have it sent to my house every month for the past seven years I know I’ve saved hundreds of dollars. We like the stuff.